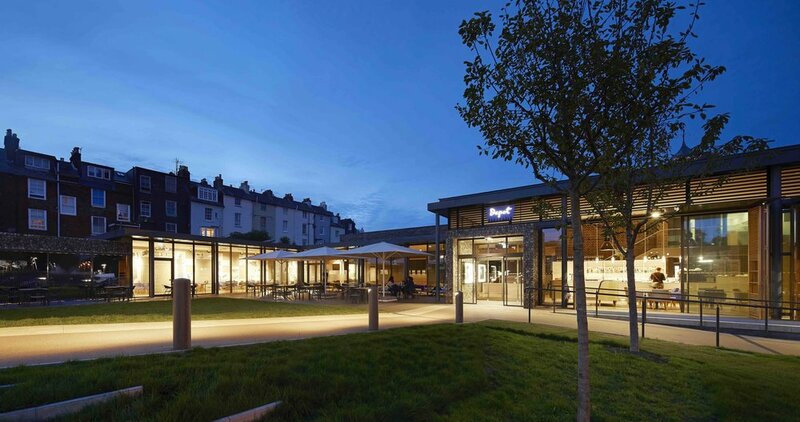 The Depot Lewes has been shortlisted for South East LABC Building Excellence Awards 2018. The Local Authority Building Control awards celebrate achievements in the construction industry. They reward excellent buildings, outstanding companies, and partnerships and individuals that go that extra mile. The Depot has been shortlisted in three categories, Best Change of Use of an Existing Building or Conversion, Best Public Service Building and Best Inclusive Building. The Depot is a new three-screen community cinema on the site of the modest but much loved existing warehouse of the old Harveys brewery depot in Lewes. The three screens have been discreetly inserted within the saved brick shell, with the major design move being to attach a new glazed extension with the depot structure fully visible as the historic backdrop to the new box office, café bar, restaurant and film education and training facilities. Reflecting the historic site layout of orchards and meadows, the former tarmacked service yard is landscaped to provide a new public realm. The project has also been shortlisted for an RIBA South East Award and the RTPI Awards for Planning Excellence 2018 in the excellence in planning for heritage & culture category.